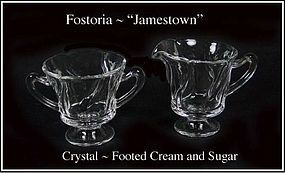 This Fostoria Crystal Jamestown creamer and sugar bowl are in excellent condition! 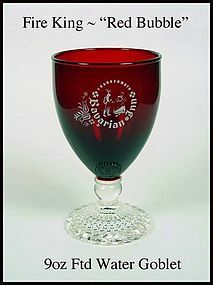 This Fire King Red Bubble footed advertising 10 oz water goblet is in excellent condition! It was from the famous Bavarian Inn in Frankenmuth Michigan where the town is covered up with visitors year around to see the Christmas Displays and eat the great food! 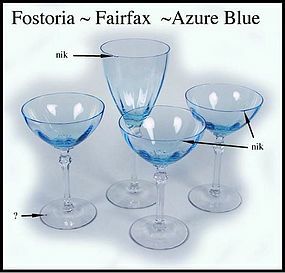 This Fostoria Fairfax Azure Blue 8 1/4" stemmed tall water goblet is in great condition except for a small nik at the top. There are also 2 champagne sherberts with tiny repairable niks at the top edge, and 1 with no chips, but does have a tiny piece of ash from the manufacturing process. All the chipped pieces can be successfully repaired. All 4 stems for one price of $25.00. 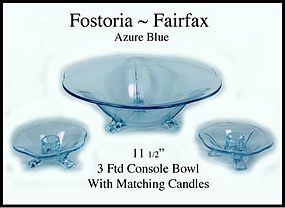 This Fostoria Fairfax Azure Blue 3 footed Console Bowl and Candle Set is in excellent condition with no damage. This set is priced at $65.00 for all 3 pieces, with no damage! 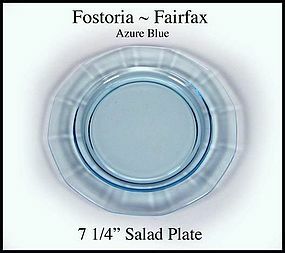 Fostoria Fairfax Azure Blue 7 1/4" Salad Plate-Nice! This Fostoria Fairfax Azure Blue 7 1/4" salad plate is in excellent condition with no damage. We have 8 salad plates available for $8.00 each. 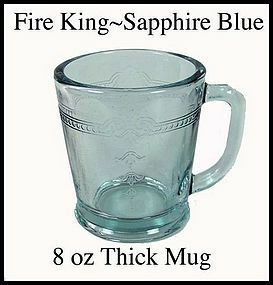 This Fire King Sapphire Blue 8oz coffee thick mug is in excellent condition! We have 1 available @ $30.00. 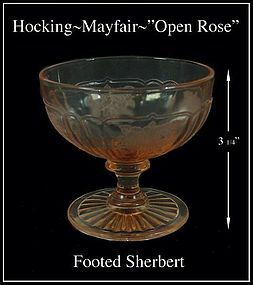 This pink Mayfair Open Rose footed sherbert was made by Hocking in the 1930's, and is in excellent condition! 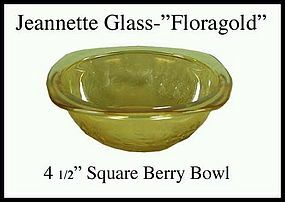 This 4 1/2" FLoragold berry bowl was made by The Jeannette Glass Co. in the 1950's. It is in excellent condition! We have 8 of the berry bowls @ $7.00 each. We prefer to sell them in pairs, or even number of bowls only. Good color! 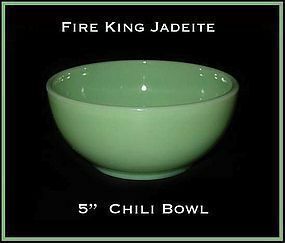 Hocking Fire King 5" Jade Jadeite Chili Bowl ~ Nice! This 5" Jadeite Jade Fire King Chili Bowl was made by Hocking and is in excellent condition! 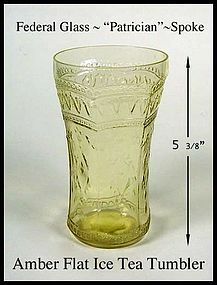 This amber Patrician "Spoke" 12oz flat ice tea tumbler was made by The Federal Glass Co. in the 1930's. It is in excellent condition! 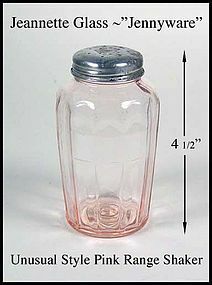 This unusual style pink Jennyware range shaker was made by The Jeannette Glass Co.in the 1930s. It is in excellent condition. The lid has a few dents and some corrosion, but still is easy on, easy off. These lids are VERY hard to find. 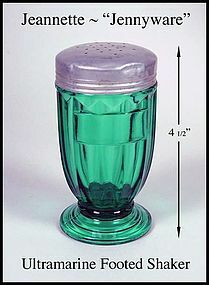 Only a few cases of these shakers have ever been found, and they didn't have lids. 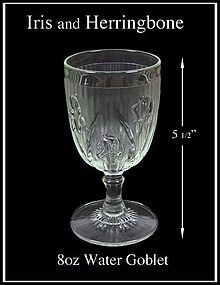 This 8oz crystal Iris 8oz water goblet was made by The Jeannette Glass Co. in the 1930's, and is in excellent condition! 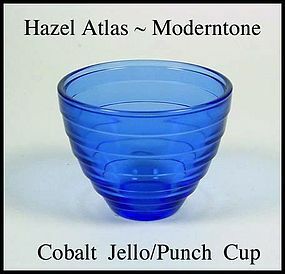 We have 10 goblets available for $7.00 each. This Block Optic Tumble Up Jug only is in excellent condition! 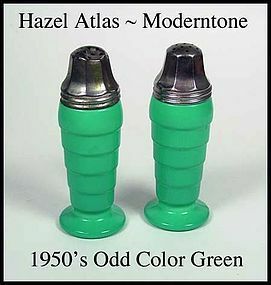 It was made by Hocking in the 1930's. There is a tumbler that sits upside down on the top of this piece, but that is missing. 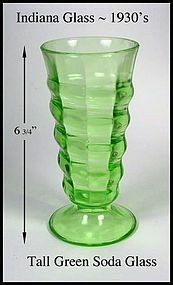 This 1920's or 1930's tall green soda fountain glass was made by The Indiana Glass Co, and is in excellent condition! You are buying a single 1940's ultramarine Jennyware footed SALT shaker. 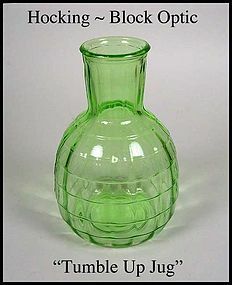 It was made in the 1940's by The Jeannette Glass Co. Very nice condition with no damage or repairs. There are a couple of dents in the original lid, but they are small. There is no label on this one, but new labels are available online.